It is Day Two of sneak peeks of the newest releases here at Paper Sweeties! I made a background of strawberries from the Home Grown stamp set! Don't they look delicious??? I stamped and heat embossed them with a dark brown embossing powder. I then colored them with water colors. I added some dimension by dotting their seeds with black Liquid Pearl. The Mason Jar was stamped onto vellum paper and heat embossed with the same dark brown embossing powder. It was cut out with it's matching Sweet Cut! SO you better come back! Check out what my Paper Sweeties Teamies have created! Mackie there is just something so wonderful about your designs! The coloring on these berries with the black pearl seeds is so wonderful and I love the vellum mason jar with the berry showing behind it! I LOVE this AMAZING card!!!!! What a FAB card, Mackie! 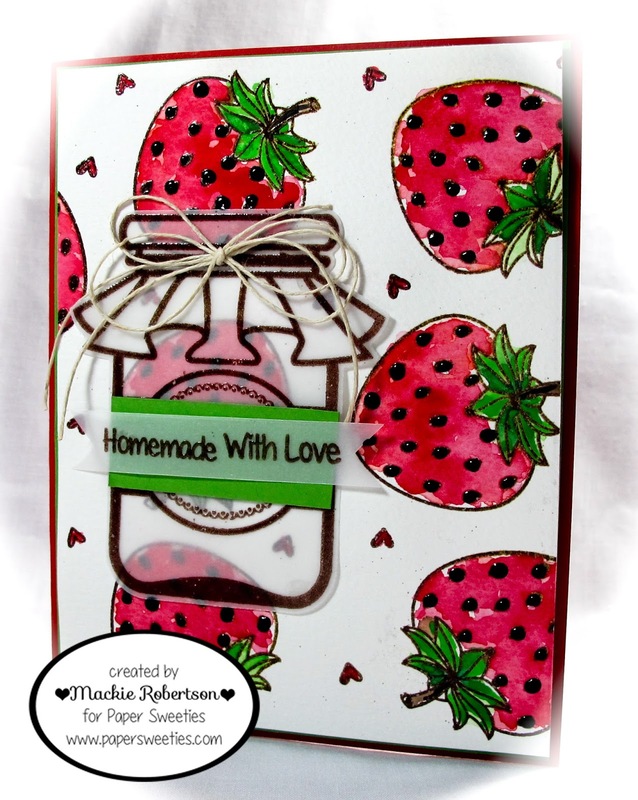 Such a sweet background with the water colored strawberries! And, the dimension with liquid black pearls is perfect! The vellum mason jar is so pretty! Super card...love it!!! Totally adorable! Love the pearl accents on the strawberries. Sweet and scrumptious colors too! What a gorgeous fruity card! The strawberries even look juicy!!! Yummy! Love those strawberries Mackie. The vellum jar looks awesome. Wonderful card Mackie! The strawberries look scrumptious! Those berries look good enough to eat!